Melt the butter in a heavy based pan and add the chopped onion. Cook gently until translucent but don’t colour the onion (for about 5 minutes). Now add the rice into the pan and stir for a couple of minutes. All the grains should be coated with the mixture and warm (they will start changing colour). Next pour in the wine that should cover the rice and let it evaporate completely. Once the onion and rice are dry start pouring in the stock in small amounts, even a ladleful or two at a time stirring the risotto base continuously. When each addition of the stock has almost evaporated then is the time for the next one (again a ladleful or two, never add too much). Carry on cooking the risotto for 15-17 minutes on a medium heat (which is long enough for the rice to turn al dente) but slow down with adding the stock after 12-15 minutes. 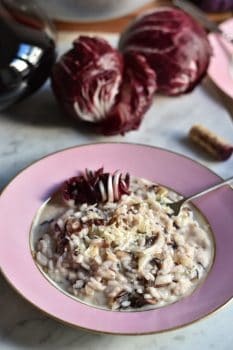 You don’t want the risotto to become too runny or wet, it should be creamy instead therefore pay attention on how much stock you are adding towards the end of the cooking process. A few minutes before the rice is ready stir in the radicchio. Once the grains turn al dente, soft but still firm at its centre, turn the heat down and wait a minute.